After launching the BHIM wallet app last month, the Government of India has introduced a new security app called M-Kavach. M-Kavach offers six important tools. It prevents misuse of the important component of your handsets. The app is designed and built in India by CDAC. Once you run MKavach, the app for Android asks you to enter a recovery number, your phone number, and device security PIN. If your Android mobile phone has been stolen, you’ll receive SMS on the recovery number. Hence, make sure that you provide a recovery number. Before you head over to the main interface and begin using MKavach, the app will send a verification code to the recovery number via a text message. It will also display a text field. Enter the code in the text field you see on the screen. 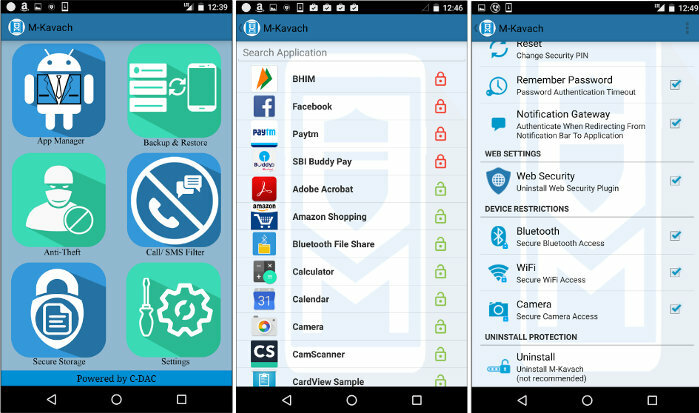 1) App Manager: This feature of M-Kavach enables you to lock Android apps. Unlike other app locker tools, M-Kavach won’t ask you to enter a pattern or pin to unlock the application. The security PIN you have provided in the configuration interface will let you unblock the application. Each time you run a blocked app, MK will request you to enter the security PIN. 2) Backup and restore: M-Kavach allows users to create a backup of the contacts and restore them when required. You can create unlimited backups with this application. Wipe contacts, call logs, SD card. 4) Call and SMS filter: If you’re getting nuisance calls frequently on your device, you can blacklist the spammer’s phone number through this interface. 5) Secure Storage: This is a premium feature. Enable or disable app notifications. Uninstall or install the web security plugin. Block access to Bluetooth, WiFi, mobile data, and the phone camera. Plugin: When you run Android browsers supported by the app on your device, M-Kavach will prompt you to install the JSGuard extension which detects malicious code embedded in websites.